Edward "Ed" Asner (born November 15, 1929) is an American actor of Jewish descent. He was the president of Screen Actors Guild. He is known for his Emmy Award winning role Lou Grant on both the Mary Tyler Moore Show and Lou Grant. In 2009, he voiced Carl Fredricksen in the Pixar movie Up. 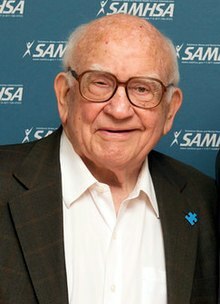 In 2011, Asner returned to television as butcher Hank Greziak in Working Class, the first original sitcom on cable CMT. He is currently starring in a Canadian television series Michael, Tuesdays and Thursdays, on CBC Television. Asner was born in Kansas City, Missouri, but was raised in Chicago, Illinois. Asner married to Nancy Sykes from 1959 to 1988. He married Cindy Gilmore from 1998 to 2007. They have four children. His ex-nephew-in-law is ex-San Francisco mayor and Lieutenant Governor of California Gavin Newsom. Asner currently lives in Santa Monica, California. ↑ Asner clearly explains his birthplace at 0:0:45 of his Archive of American Television interview for the Academy of Television Arts & Sciences, available at . This page was last changed on 12 April 2019, at 22:37.